Black holes are some of the most fascinating astronomical objects for the general public, and they do come up quite often in popular culture (think Interstellar…). 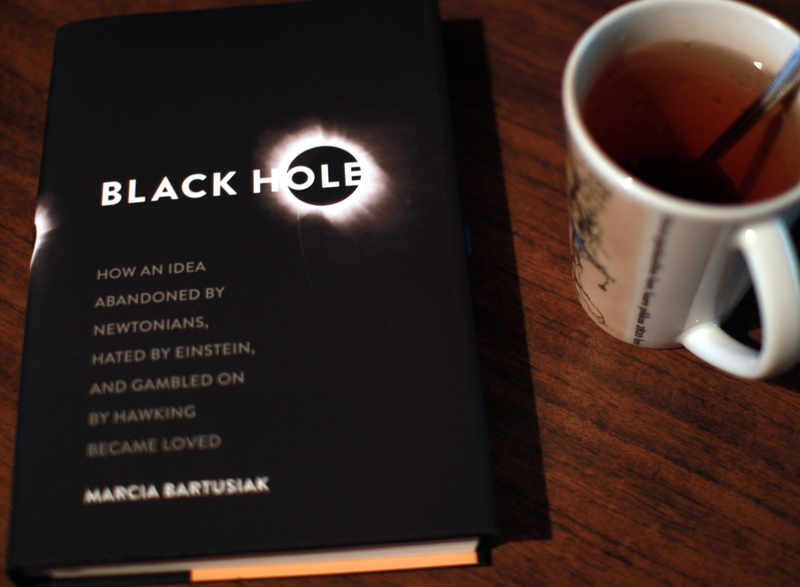 Bartusiak’s “Black Hole” brings the history of the idea and the basic physics (or as much as scientists know about the laws of physics governing black holes) to the general reader in a fun romp through centuries of scientist thinking about the possibility of an object with such huge mass that even light would not get out. The last time I read about black holes was in October of last year, when I also wrote a review of Caleb Scharf’s “Gravity’s Engines”. Then as now, I wasn’t altogether interested in black holes – it’s something to do with their popularity and the fact that more than 50% of questions I get at work from children are about black holes. Anyway, despite my dislike for black holes, I find myself once again enjoying a book on the topic enough to rate it with the highest 10 points. Maybe it’s just that I like how well organized and systematic the book is and how you find out more about some astronomers and physicists you might have heard of but wouldn’t connect with black holes. One thing that I like the most, ofcourse is, when an idea is considered so outlandish, that scientists try to prove that such a thing just simply can’t exist, as was the case with black holes. And that is basically what you can read about in the book in great detail. In short: the book is excellent, nothing like Caleb Scharf’s book although the topic is partly the same. And you don’t need to know a lot of physics or higher mathematics to fly through it in a couple of sittings.